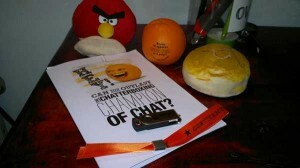 The awesome people of WOM World have sent some surprise #Chatterboxing swags to our doorsteps. The package includes some themed Annoying Orange gears. Inside the orange bag contains squooshy orange ball, bracelet, usb stick, Hey! You! T-shirt and a sounding card with all the same notes to visit ovi.com/annoyingorange. These gears are mostly likely preparations for the upcoming #Chatterboxing events sponsored by Ovi and Nokia with a special participation of the Annoying Orange. The event is not yet live but it says that it will start on 4th February. So what’s best now is just to keep our eyes peeled for this one.